Display advertising is everywhere you look. Splashed across social media, bordering that blog you like sat atop the headlines on the Sky News website – it’s the paid, digital marketing tactic used by most businesses, without you even knowing it. That said, we’re so used to seeing adverts that we habitually flick the anti-ad switch in our brain. In fact, approximately 200 million internet users have installed ad blocking software for this very reason. The modern marketer is now faced with a new kind of challenge: make a display ad campaign that both stands out from the crowd, and sticks in the mind – which, considering the competition, is easier said than done. Read on to learn what display advertising actually is, how it works, and for examples of display ads designed for a variety of online platforms. How do display ads work? A visual form of advertising that incorporates both text and graphics, display advertising appears on specifically designated areas of a website or social media platform in the form of a banner ad. The internet’s answer to billboard advertising, display adverts (otherwise known as banner ads) are designed to increase the click-through rate to a landing page. This is done by cleverly combining striking imagery, attention-grabbing copy, animation, and even video content – using more than just words to create a stand-out, snapshot ad. Display advertising is most commonly used to increase brand awareness, and to re-engage with customers who have previously paid your site a visit. It can also be used, to generate new customers by leading them to a landing page via a click-through path. The point of a display ad is to engage the potential buyer, and develop their interest in your product or service before going in with the hard sell. If you’re thinking of making a display ad yourself, be sure to consider the format. JPEG, JPG, PNG, and GIF images are all accepted by any network, but not all networks accept HTML5. Animated banners come with their own technical specifications, while image banners only need to be under 150kb in size – and of course, be compliant with regulations set by the ASA. 300×250 The medium rectangle ad – at it’s best when embedded within text, or at the bottom of an article. 728×90 The leaderboard ad – does well when placed at the top of content and is a popular choice on forum sites. 300×600 The half page ad – more space means more content, but it also means more money. Highly appealing visually, and highly clickable. 320×100 The mobile banner ad – can be used as an alternative to the medium/large rectangle ad, and provide twice the height of the standard mobile leaderboard size. Delivers highly relevant ads to your audience based on specific user behaviour and interactions. For example, creating specific adverts targeting users who have reached your pricing page, but do not complete their order is an example of retargeted display advertising. This works by using the data generated from their visit to your site to then direct adverts containing similar, or same-category products. This can be done automatically using dynamic remarketing display adverts, which are popular on e-commerce sites. Dynamic remarketing works by pooling information from the data feed regarding the product or service that the customer has been viewing. This information is then used to automatically create a customer-specific banner ad based on a premade template. Link your Google Ads (formerly Google AdWords) account with your Google Analytics account. Next, create remarketing lists. These are specific website visitors to be targeted on account of their previous interactions with your website, ie: those who have seen a particular category collection. Finally, within AdWords, make a remarketing campaign with different ads targeting different customers based on their interest in the product or service. All done! Now, when your customers visit your website then leave again, they’ll still have visibility of your brand via online marketing. This recurrent visibility will help to build trust with your audience, as brand familiarity increases brand trust. This type of campaign focuses on driving direct sales and acquiring new customers, doing so via in-market audiences, affinity audiences, and interest targeting. In-market audiences are those looking to make an immediate purchase. Google will be able to know who these people are based on search history. For example, someone reading mattress reviews, searching for local bed shops, and looking at different supplier sites is probably on the hunt for a new mattress (and maybe some funky new pyjamas too). Affinity audiences are a little harder to pin down. This term might refer to those who aren’t in ‘research mode’, but might – in light of their online profile – still be in the mood to buy. These people are categorised as ‘long term interest’ prospects by Google. Once the affinity audience member has been categorised, streamlined display adverts will appear on the sites they visit that support display adverts. To illustrate: someone who avidly reads the interior design blogs they subscribe to, and regularly listens to a ‘how to decorate’ podcast, would be categorised into the ‘home and garden’ affinity marketing group (available in Google Ads). Focussing on reach rather than conversion, an awareness campaign requires careful planning. In order to be effective, it will also need to run for quite a long time, which is costly in both time and resource. The aim of the awareness game is to reach as many people as possible whilst sticking to your budget. Likes and shares will help to further your reach, but securing these in the first place can be tricky. Some businesses will even pay for more visibility and followers, but this can be obvious to the reader, so we recommend sticking to organic, SEO-driven methods. Whilst a brand awareness campaign won’t have the same clear ROI as one that focuses on acquisitions, it will have possibly unseen benefits in the long run. Brand familiarity can do wonders for your business, as the more the customers see the brand, the more they’re likely to they are to trust it. Using the same basic principles as print advertising, display ads are designed to inform, engage, notify, and increase awareness. They work by generating traffic to your website from an external source. The point of a display ad is to encourage the customer to click on it. Simple. To increase the chances of being clicked, display advertising targets people with specific internet habits that are linked to the product or service being advertised. Rather than just appearing in the customer’s search results, , display ads differ from normal ads in that they appear on different websites in a variety of forms. They can be static or animated, contain text, an image or both, and can appear on social media platforms in the form of Facebook banners, Snapchat geofilters, or Instagram sponsored ads. Banner ads also appear on regular websites in the reserved advertisement space, ie at the top, bottom, or down the sides of a page. Display ads work by targeting customers who have already expressed an interest in your product or service, which is detectable through their previous site visits or browser habits. This increases the ad’s chance of being clicked, and your chances of getting a conversion. Don’t worry, though – it’s not all left to Google guesswork. You can have a say when it comes to the placement of your Google ads, and can opt for either automatic or managed placements. Google will determine the placement of your ads based on the sites it deems relevant to your business. You can decide on the placement of your ads based on customer search trends and business relevancy. Of course, the way to gain complete control over who sees your advert is to buy advertising space on a specific website. That way, you’ll already know the tone of the site and the type of audience likely to see the advert. To properly describe what different display ads might look like would take quite some time. So, as pictures speak a thousand words, we’ve put together some display ad examples to show what display advertising really means. LinkedIn banner ad – This is an example of brand awareness display advertising that is specifically designed for LinkedIn, and made to get the brand name ‘out there’. The reference to ‘work’ in the slogan makes it clear that the ad is designed for LinkedIn – the pun is intriguing, but there’s no hard sell here. An ad like this would feature in LinkedIn’s paid advertising space. Note: LinkedIn banner ads are: 1400×245 px. A medium-rectangle ad, designed to be an acquisition display advert on a search-appropriate website, such as an interior design blog. This captures the user intent – interior design – and subtly displays an advert that is in-line with that intent. This display advert would appear in a paid ad slot. Large-rectangle ad – designed as a retargeting display advert to be used on any site the targeted prospect is likely to use, ie: social media. 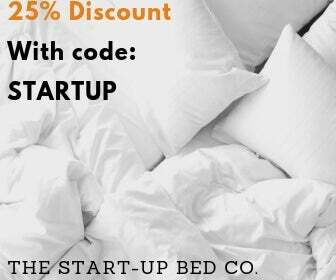 The discount offer and code are larger than the brand name, as prior brand familiarity is assumed. The same background image as other display adverts is used for consistency. However, the slogans have been replaced with an enticing offer, which encourages the customer to click through to the website and use the promotional code. All three of the above display ads are marketing the same company, using the same principle, but targeting different customers at various stages of the user journey. The time and placement of the adverts is determined by the audience’s search habits. If they’ve never searched for ‘beds to buy’ on Google, they’re likely to see example one (the brand awareness ad); if they have Googled ‘beds to buy’ but never visited the Start-up Bed Co’s site, then Google will assume they’re interested in buying a bed, and will show them example two (the acquisition ad); and, if they’ve previously visited the Start-up Bed Co’s site but didn’t purchase a new bed, then Google will show them example three (the retargeting ad) to lure them back with an exciting offer they can’t refuse. Display advertising is a type of paid marketing that grants access to a variety of online platforms, and targets customers and prospects according to their search intent. An efficient and effective method of digital marketing, display advertising gets your business’ name out there and keeps it in the mind of the buyer. Using social media ad space, as well as related websites and organic searches, display advertising is everywhere – and now you’ve read this article, you probably won’t be able to stop spotting display ads in your day-to-day online activity. 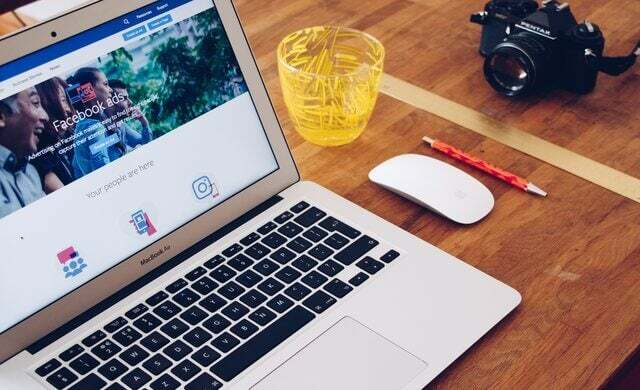 For properly targeted social media campaigns, a social media management system can streamline your approach – maximising efficiency and your profits. Keen to find out more? Pop to the top of the page, and we’ll put you in touch with reputable suppliers.